Okay. I'm not saying that this blog is necessarily going to become a repository for all things Robin Hood. Not as such. But you are all familiar with my . . . what's the word . . . thing . . . for thieves. And Robin is perhaps the thief I've loved the longest. So it should come as no surprise when I say that I was filled with glee when I first heard about A. C. Gaughen's upcoming retelling--Scarlet. I liked the cover and, without running down too many spoilery details, I looked forward to the focus on Will Scarlet and the fact that it hailed from a debut author. All of these things add up to that most wonderful of things--possibility. 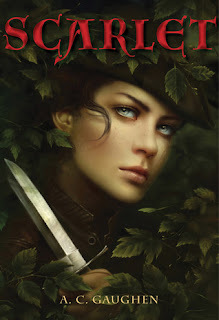 I've reviewed both my favorite Robin Hood retellings for past Retro Friday reviews. And I've read quite a few more. They have all been interesting reads aimed at a variety of types and ages of readers. This particular one is being marketed YA, and I wondered idly, as I anticipated the book, what form my beloved characters would take in this incarnation. Scarlet is a thief. And a liar. She's a thief and a liar and about twenty different kinds of deadly with her knives. And she's loyal to one person on this earth and one person only--Robin Hood. Also known as Robin of Locksley or (less commonly now) the Earl Huntingdon, Robin gave her a place and a hood to hide behind when Scarlet needed it the most, and now she forms an integral member of his band in Sherwood Forest. Standing up to the ruthless Sheriff of Nottingham, Robin, Scarlet, and the lads (Little John and Much) are determined to spare the good folk of Nottinghamshire from the sheriff's wrath for as long as it takes. Outside of her three comrades, few folk have any idea Scarlet is a girl. The boys refer to her as Will, and she has no intention of disobliging anyone of that particular notion. You see, Robin is not the only one with demons in his past. And when the sheriff goes and hires the dreaded Guy of Gisbourne to hunt down the Hood and his band, Scarlet knows her days may at last be numbered. It's only a matter of time before her past catches up with her, and then even Robin's protection may not be enough to keep her from the hangman's noose. Scarlet is massively entertaining. I was caught up in this unusual thief's story from the first page. At the point in which we meet her, Scarlet herself is eighteen years old. The same age as John and just a couple or three years younger than Rob (I love that she calls him Rob). This age spread worked nicely as Robin is home from the crusades--an old man in a young man's body--and Scarlet herself is an old soul, having prowled the streets of London before Rob hauled her off to Sherwood to join his noble cause. These two broken youths find something akin to hope in each other despite the harshness of their previous lives, and I can't tell you how many times my heart contracted with sympathy for them. The characters in Scarlet like to keep their secrets. Every one of them is holding onto something they'd prefer not come out into the light of day. Nobody more than Scarlet herself, of course, but I appreciated the various histories and enjoyed the ways in which A. C. Gaughen incorporated the many traditional threads of the tale. I'm always a fan of girls in disguise, and this one has the bite to match her bark, if you will. She has few soft spots--possibly just the one--and that one is so rife with impossibility and unspoken hope that it hardly warrants the name. But I happily plunged into those impossible hopes with her and adopted them as my own. Which is to say, Scarlet had my affections from the get go. The boys I liked at first and grew to love (and sometimes hate) as the game unfolded. I like that Robin isn't portrayed perfectly. Don't get me wrong. He's a hero through and through. But he has his fair share of shortsightedness. And ghosts. And I wasn't always sure he deserved the ending I wanted for him. I also wished for a bit more complexity on the part of the villain. There was so much potential for Gisbourne in this retelling, and I felt as though he came off a bit, well, ridiculous at times, when he should have been terrifying. But despite these smallish quibbles, I stayed up hours past my bedtime devouring the final chapters in this delightful debut. If you're at all a fan of Robin Hood and women who know their way around a weapon, you won't want to miss it. Scarlet is due out February 14th. But I absolutely LOVED it too! Read it all at once, couldn't put it down. Is Gisbourne a love interest for Scarlet? This sounds fabulous!!! The cover alone is delightful but I'm definitely adding this to a need-to-read pile for next year!! Ooo, I hadn't heard of this one but I'm loving the cover. I've never been a HUGE fan of Robin Hood but I love girls in disguise books so I'll have to give it a try. I saw this one when it first came out, but didn't get around to reading it. I must remedy that. Also, you need to read The Demon King. Since you love thieves so much. I love the way you make this sound! I'm always up for a good Robinhood retelling ;) And a strong woman is a bonus!! I actually don't think I've read any Robin Hood re-tellings. This one certainly captures my attention though. Allison, I'm so glad you did, too! I couldn't resist starting it. And I really enjoyed Scarlet's voice. And I have to say I'm pretty excited for you to read the other two retellings so I can hear what you thought! Sarah, awesome. They're just . . . such fun, compelling characters. Katie, you wicked girl. Now that's all I can think of. *ponders* But no. In this case, I would not categorize him as a love interest for Scarlet. Bish, I definitely did. With the couple of reservations about the villain. lisa, it is a nice cover, isn't it? Fits the story as well, which is always lovely. Jenny, yeah, and that trope works just really well here. She is one tough girl. Emily, lol. I was wondering when you'd remind me about that. And look at you, you went and watched N&S. I will bump DEMON KING up. librarian, yep. This one's got 'em both. Hard to resist. Does that mean Scarlet and Robin are an item? No Maid Marian? Hm, I don't know if I should delve into spoiler territory here. There is a love "triangle" of sorts involved. But it's handled in a non-annoying fashion. Though you might want to beat one or more of them about the head one or more times before it's through . . .
Been dying to read this since AC joined the Apocalypsies. Go SCARLET! AC, my pleasure! And thank YOU for the hours of happy reading. leigh, I'm excited for SCARLET and can't wait to see how it goes over. SHADOW & BONE looks amazing, btw. Can't wait to get my hands on it! Angie, I think you already know this but I also have a thing for thieves. :P Added this one to my wishlist but I probably won't grab a copy until I read Lady of the Forest. Ooh this sounds fabulous, I must add it to my list. I am developing quite the love of thieves and liars this year! Chachic, hehe. I did know that about you, as a matter of fact. :) I admit I did check your blog to make sure I hadn't missed a review of LADY OF THE FOREST since I know you own it now. Looking forward to that! This sounds awesome! !The cover page of this book is beautiful. I have not yet read anything related to the tale of Robin Hood but thinking of reading this book soon because i loved your review. Thanks for sharing the post.